Why is the project planning phase so important for successful implementation and closure of a project? In order to be in control of the project activities and results we need a "list" of actions and their required results; that is, we need a plan. Let us explore the planning process in its most important aspects in order to get an overview of the planning steps and what results each step produces. What do we need to plan? How can we provide sufficient flexibility? What tools can we use? How do we document the planning results? The following two pictures show what plans we need, and in what sequence we are going to create them. We translate this into the following more process-oriented view. This picture reflects the basic project planning process with the core planning steps, which we will follow in project planning phase. We plan the project scope in two steps, first the product breakdown structure PBS which describes the product or service we are going to create with the project. In a second step, we setup the work breakdown structure WBS that describes all the work that has to be done in order to create that product or service in the form of work packages. For a more detailed description please go to Planning the Project Scope. After setting up the WBS we have to estimate effort and duration of each work package. We do this by asking the work package experts how much of what resources they need, for what period of time, thus obtaining the effort. We recommend combining effort estimation with the first risk analysis into a workshop in the project planning phase, with all the experts involved. Then we have better chances to avoid over- or under-estimation, or hidden “security blankets” for the work packages since we can discuss these issues openly with the whole team and address critical items and risks explicitly. For a more detailed description please go to Effort Estimation. Planning the project schedule comprises three steps: planning the milestones, creating a network diagram of all the work packages, and setting up the Gantt chart. The milestone plan gives us a top level view of the project without the details of all the work packages. In the network diagram we arrange the logical sequence of all the work packages, while the Gantt chart represents the actual time schedule of all the work packages of the project. You find a detailed description in sub-section Planning the Project Schedule. Network diagram and Gantt chart also help us to analyze the critical path in order to identify risks affecting the schedule. Having prepared project scope and schedule, we now assign all the necessary resources to each one of the work packages, that is, human resources, tools, and material. Especially, getting all the human resources on board requires some preparation: we coordinate the level of skills and experience of the available people with what is needed; we prepare and discuss their target agreements; we prepare, negotiate, and sign sub-contracts for those work packages that will be provided by external suppliers; we set up and maintain close contact to those resources that are critical; we coordinate the resource planning of our project with that one of others. For a more detailed description please go to Assigning Resources. 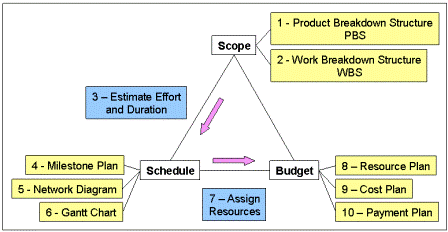 Planning the project budget, in another three steps, concludes the core of the project planning process. Having all the resources assigned, we can now allocate hourly rates of human resources and tools, as well as material cost, and integrate all these data with the project schedule on work package level. Thus, we obtain the finalized resource plan, and from that, the (accumulated) cost plan. Together with a payment plan (in case of a customer-contractor based project) or sales plan (in case the project is about product development, marketing, and sales) we prepare the financing plan for our project. For a more detailed description please go to Planning the Project Budget. In section "Fundamentals of Project Management", we share our experience about the most critical factors why projects run into problems. Poor planning results are definitely on the top of the list of reasons. If you are looking for a complete description of the core project planning process, we offer you our e-book, Project Planning Guide, in PDF-format. It covers the 10 steps of planning and contains a real life example (a photo-voltaic solar plant) to illustrate the application of the explained principles. We can go through steps 1 to 10 of project planning phase and set up the entire project plans manually, with paper and pencil. Of course, using planning software, such as the open source solution ProjectLibre, is much more convenient. However, we should keep the whole project planning process as joint effort of the project team. would conclude project planning phase. But real life holds just too many surprises, and thus, we need to prepare for eventualities. In order to prepare for flexibility in implementation and closure phase we need to integrate another important element into project planning: the risk management process. When shall we ideally start the risk management process? risks of missing resources after producing the resource plan. Thus, it is essential to start the risk management process early in project planning phase, e.g. combined with effort estimation, and depending on the size of the project, repeat the risk management steps 1 to 4 after each step of planning. Ideally, we combine steps 1 to 4 into what we call “risk analysis”, and we usually carry out this risk analysis in workshops of one to three days, depending on the size of the project. (1) Preventive actions, i.e. add-ons to already existing work packages or completely new work packages which we have to integrate into the WBS and all the other planning documents. (2)	Corrective actions, that also add to the WBS or make for decision points in our project plan in the following way. If event X happens then we follow plan A, if X does not happen then we follow plan B. Preventive and corrective actions together reflect our risk management strategy or risk management plan. Creating contingencies in form of corrective actions or just in form of budget reserves represents the first important part of keeping our project plans flexible for foreseeable eventualities in implementation phase. For a more detailed description please refer to sub-sections Risk Management and Risk Analysis. While risk management can take care of foreseeable eventualities there will be things happening which nobody can plan for. For all unforeseeable events we need to make provisions in a different way. We only know that something is going to happen that will change project scope, schedule, or budget. So, we have to prepare a project change management process that tells us how we are going to deal with necessary changes. (1) Situations in which we have enough time for finding mutually agreed decisions before implementing any change, without jeopardizing the project goal(s). (2)	Situations in which we cannot wait for mutually agreed decisions before implementing a change. Many projects are based on contracts, and thus, on contract structures setup in definition phase. Now, in planning phase, we have to refine the contracts and their content in order to integrate a project change management process for the first type of situations, and a project claim management process for the second type of situations. Thus, any contract which includes clauses for project change and claim management, helps us to keep our project plans flexible for all the unforeseeable eventualities in implementation phase. For a more detailed description, please go to Project Contract Management. In order to collect all the details we ask our team members who are responsible for the work packages periodically, in scheduled project status meetings. Obviously, there must be a high level of trust in each other to obtain the truth about each one of the work packages. This high level of trust is the key to successful project controlling. For a more detailed description please go to Project Controlling Tools. In order to make all this project communications successful we need to prepare a project communications plan. For a more detailed description please go to Project Communications Plan. We undertake projects in order to create clearly specified results, products, or services. These clear specifications or requirements are the result of the activities in definition phase and part of the project goal(s). They guide us in planning phase to create the plans and help us at the end of implementation phase and in closure phase to decide if the project goal(s) are reached or not. In case we have to follow a contract we develop acceptance procedures for preliminary and final acceptance of the project results, discuss and negotiate them with the customer, and integrate them into the contract. Acceptance procedures define how we are going to check the project result(s) if they are compliant with all requirements and specifications set in definition phase. Hence, contract clauses that describe, or are related to acceptance procedures, significantly contribute to the decision if the requirements and specifications are met, and thus, project goal(s) are reached. 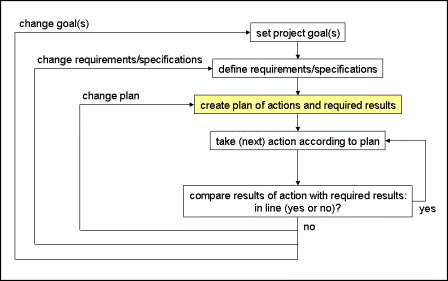 Optimization of all project plans turns the project planning phase into a recursive process – sometimes with many back-loops. You find some details in sub-section Project Management Plan. Certain problems with the estimation of effort and duration of work packages and some behavioral aspects in organizations seem to be some of the reasons why projects run into delays or cost overruns. The critical chain method, introduced by Eliyahu M. Goldratt in 1997, holds ideas that could be helpful. While planning the project should be a joint effort of the whole project team, we use supporting planning software for our convenience. We just need to make sure that we do not become slaves of a specific software package, but rather tailor the software to the requirements of the project and the team. You find some details in sub-section Project Planning Software. 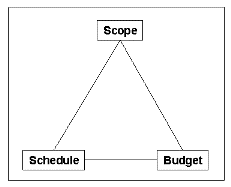 Planning scope, schedule, and budget define the classical core of the project planning process. Important steps in this process are effort estimation and the assignment of resources. As part of the contract, we setup acceptance procedures for preliminary and final acceptance of the project results. In order to create enough flexibility we supplement this by a risk management plan, and by integrating change and claim processes into the contract. Ideally, the supplier follows these planning steps when preparing a proposal that has to be submitted to the customer. Finally, we set up the controlling tools we want to use and define our project communications, reporting, and documentation. After mutual negotiations, customer and supplier sign the contract for implementation phase. This concludes project planning phase, and we continue with implementation phase. In this sub-section, we summarize what counts as project records and provides evidence for claim cases.